As a part of the Carolina Multiple Listing Service (CMLS) Moss Realty has been serving Gaston and surrounding counties for over 20 years. In addition, we are very active in Belmont, Mount Holly, York, Kings Mountain, Shelby, and Rock Hill. 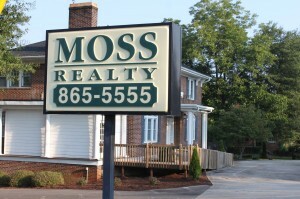 Moss Realty has flourished as a result of it’s continued attention to customer satisfaction. We believe that there is a “Home for Everyone” as long as we continue to listen and put their best interest first. Whether you are looking for new, used, or custom built – that “Special” home is waiting just for you. We also have agents specializing in lakefront, commercial, acreage, even farms. The decision to buy or sell your home is a lifetime decision and one you’ll always remember. We make your experience, pleasant, hassle free, with no hoops to jump through. We do that for you! Our clients boast of our professionalism, hard work, customer focus, and integrity. Due to years of experience and thousands of transactions, we are prepared to service every neighborhood, community , city, town, and county. You will constantly be informed of all activities on your behalf. Through your Personal Agent, a staff of 10+ Professionals, and the Personal Touch you receive, no questions will go unanswered. (Tour our beautiful facilities when you have a chance). Because of our years of professional ethics, national and local banks, as well as brokers take Pride in offering our customers programs that may not be available through another agency. We are conveniently located in Gastonia serving North and South Carolina, Gaston, Mecklenburg, Lincoln, Cleveland, and York Counties.